WEST LAFAYETTE, Ind. — Purdue University’s second Electric Vehicle Grand Prix will feature an expanded field of karts and new battery technology. The evGrandPrix will begin at 1:00p on April 30th on the Purdue University Grand Prix track northwest of campus in West Lafayette. The event is a prelude to the inaugural Purdue Collegiate evGrandPrix, which will be run May 7th at the Indianapolis Motor Speedway. 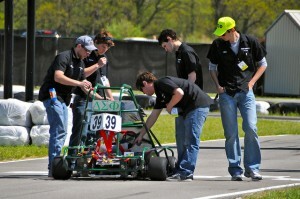 At Purdue, 25-30 karts are expected to race 100 laps. Teams will come from Purdue; Ivy Tech; Indiana University-Purdue University Indianapolis; Coventry University and the University of Warwick, both in Coventry, England; and Dublin Institute of Technology in Ireland. All of the teams, including those from England and Ireland, are expected to also compete in the May 7 event. The evGrandPrix is an outgrowth of the Indiana Advanced Electric Vehicle Training and Education Consortium (I-AEVtec), which is developing degree and training programs for the electric-vehicle industry. Some of the karts are built as part of class work developed through I-AEVtec. “Electric vehicles represent the future, and, through the evGrandPrix, we’re getting students not only prepared but excited about that future,” said James Caruthers, I-AEVtec director and the Reilly Professor of Chemical Engineering at Purdue. The evGrandPrix is more than just a speed race. “It is a complete engineering design experience,” Caruthers said. New this year, some of the karts will be powered by lithium-ion batteries donated by Ener1, an Indianapolis manufacturer of the batteries. The batteries are the same ones that power Think City, an electric car built in Elkhart. The advantage to the kart teams is that those powered by the Ener1 battery will be able to run the grand prix without stopping for a battery change. Previously, all of the karts were powered with hobby batteries that don’t have enough juice for the entire race. The Indianapolis event will be run during the Indianapolis Motor Speedway’s Emerging Tech Day, a part of its centennial celebration. Forty teams from 10 universities throughout the United States and Great Britain are expected to race on a course set up on the Speedway grounds. The public is invited to both of the evGrandPrix events. Admission is free. Caruthers especially encourages parents to bring middle-school students. “They are at the age where we want them to consider careers in engineering and technology and what better way to get their attention than with student-built vehicles racing on a track,” he said. The Purdue Grand Prix track is at McCormick Road and Cherry Lane, just west of the Purdue campus. Gates will open at 11 a.m. April 30. Handicapped parking is available at the track. For all others, parking is available in the lot next to Ross-Ade Stadium, with shuttle buses to the track.